The winged figure of a woman, dressed in a long robe, is seated at right; she rests her head on her left hand and holds a compass in her right. 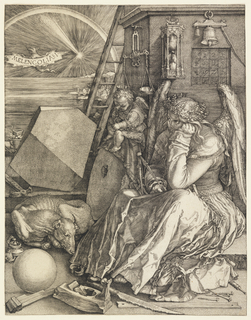 A winged genius is seated beside her, writing on a tablet. Behind them is a square tower that displays a scale, an hourglass, a bell and a magic square. The foreground is litered with various instruments related to carpentry and construction: a saw, a plane, a hammer and nails and lengths of wood. At left, a dog sleeps curled between a sphere and a polyhedron. In the distance, in front of a sunset and rainbow over the sea, a bat flies, the word 'Melancolia' engraved across its outstreched wings.